Electric S-brane solutions with two non-composite electric branes and a set of l scalar fields are considered. The intersection rules for branes correspond to Lie algebras A 2, C 2 and G 2. The solutions contain five factor spaces. One of them, M 0, is interpreted as our 3-dimensional space. 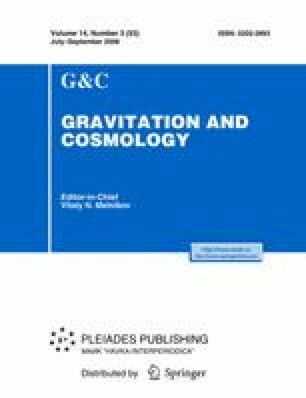 It is shown that there exists a time interval where accelerated expansion of our 3-dimensional space is compatible with a small enough variation of the effective gravitational constant G(τ). This interval contains τ 0, a point of minimum of the function G(τ). A special solution with two phantom scalar fields is analyzed, and it is shown that, in the vicinity of the point τ 0, the time variation of G(τ) (calculated in the linear approximation) decreases in the sequence of Lie algebras A 2, C 2 and G 2.